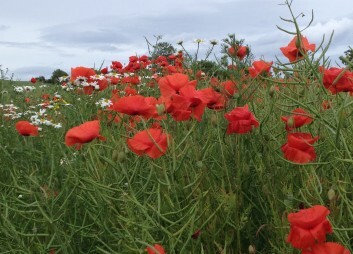 Recently I chanced upon possibly the most impressive display of poppies I’ve ever seen. This agricultural weed (Papaver Rhoeas) assumes a special place in our hearts as a thing of both poignancy and delicate beauty. Less loved for obvious reasons is its cousin Papaver Somniferum, the opium poppy. Yet its undoubted power can be harnessed for good when prepared homoeopathically. Utilising the ‘like cures like’ principle common to all homeopathic preparations, Opium as a homeopathic remedy has an affinity with deep neurological states and conditions such as narcolepsy, convulsions, delirium and strokes. It’s also a key remedy in acute or chronic effects from fear. It’s a shining example of how the homeopathic process of serial dilution can render even the most powerful toxins not only harmless but positively beneficial. That’s the quiet strength of homeopathy – and truly the stuff of alchemy!